Update: The Songbird site is overloaded right now, but here's a download mirror, and another. Some discussion on this digg thread. I spoke with Rob Lord earlier today by phone about the preview release. Screenshots and interview after the jump. BB: So why did you guys build this? RL: People should have more choice about music and video formats, and where they get their music. Imagine what your experience of the web wold be like if IE connected only to microsoft.com. That's what digital networked media players are like today. Fairplay [Ed. Note: Apple's proprietary DRM] is the 8-track of our generation, and those formats may become obsolete a lot sooner than people using those services realize. 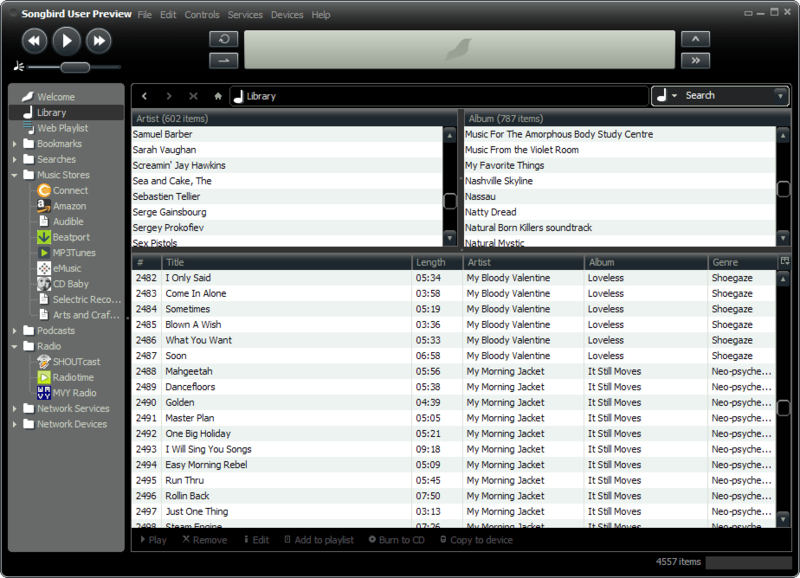 Songbird can connect to any a la carte media store -- downloadable music, radio, video, P2P networks, and classes of services that haven't been created yet. Services like iTunes -- where everybody has to shop from the same store -- are like walled garden online services back in the early days. AOL, Prodigy. That's how we connected to the 'net then. 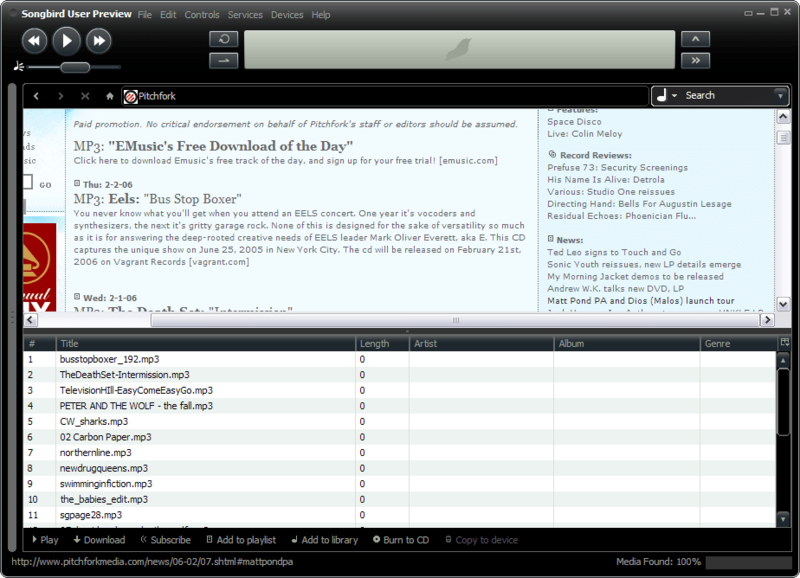 Songbird is to iTunes what the Firefox browser is to those old, limiting online services. 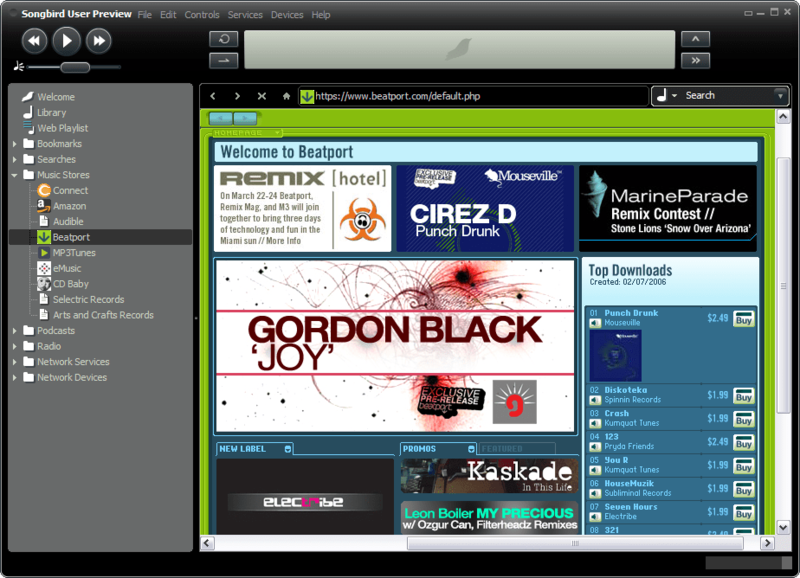 It opens up the whole internet to you as a music browsing experience. BB: Should the RIAA be worried about you? RL: As we say in our FAQ, "We don't steal music and you shouldn't either. We support DigitalConsumer.org's Bill of Rights as the best means to a burgeoning, diverse and lawful digital media market." BB: Who funded the project, and how will you make money in the future? RL: I provided the funding. I think we're going to put a "donate" button on the site. And we're going to sell t-shirts, and maybe some songbird-shaped fuzzy holders for digital music players. BB: Apart from the ability to connect to lots of different sources, what will Songbird do differently? RL: The opportunity to innovate is stymied by architecture. All of the popular media players out there have pretty much the same feature set on the desktop -- when you leave aside what's possible when you connect to the internet, they all do pretty much the same thing these days. Rip, mix, burn, play, organize playlists. But plug them in to the internet, and there's so much more they could be doing. The possibilities for networked services are totally untapped. For instance, [Winamp co-creator] Justin Frankel created a collaborative jamming service, and you can't do that inside any commercial media player now. You'll be able to do those kinds of things inside Songbird. BB: Why does the ability to obtain music from multiple stores or sources online matter? RL: Why wouldn't you buy your bluegrass in one place and your trance music in another? Why shouldn't there be music communities like lastfm and others that focus on specific niches? Even if you could buy all your music in one place, like Wal-Mart, would you want to? Maybe the experience would be better if you could connect to lots of different places, and communities, and social networks. BB: What's in it for those providers? RL: It's an open format, so they can do deep integration into our player, and reach new audiences. We built Songbird on the Mozilla Foundation's XULRunner platform, which is also used by Firefox and the Thunderbird email client. Firefox is very widely used now, there are 400 extensions, everybody knows it's as much of a movement as a piece of software. The difference between the Firefox and Internet Explorer browsers is substantial, but it's nothing like the difference between iTunes or Windows Music and Songbird. BB: Songbird's logo is a cute, rotund, whistling birdie -- but what's up with that puff of gas coming out of his posterior? Is your mascot farting?